Add a piece of history to your Colonial Decor. Lighting by Hammerworks Carpenter Hall Tin Mirrored Wall Sconce S133A is named for the historic Philadelphia building it was originally designed for in 1774. This handsome Antique Reproduction mirrored wall sconce is a quintessential classic among Early American designs. 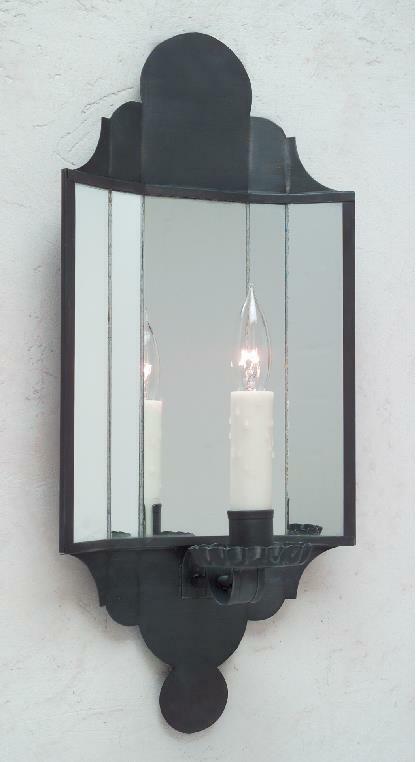 Hammerworks Carpenter Hall Tin Mirrored Wall Sconce is an excellent choice when you want to create a dramatic statement. Because Hammerworks offers several styles and sizes of handcrafted antique mirrored sconces, you are sure to find just the right one to complement your setting. As with all of our lighting, we make each sconce by hand using tools and techniques of yesteryear. Furthermore the mirror for these historic colonial sconces is hand cut and carefully placed individually. The mirror’s reflection adds depth to the sconce, as well as to the overall room design. .Also each Hammerworks mirrored wall sconce is available in your choice of solid copper, brass or tin. Consequently this allows you versatility in coordinating with the color scheme and style of any setting. Whether you are decorating a classic Williamsburg, Colonial, Cape Cod Style Cottage or New England Farmhouse, we offer a sconce style that is just right. As a result our Colonial wall sconces combine beauty and function making them a perfect decorating accessory for any home.